Use the free desktop app for Windows and Mac. Use a dedicated application. Run PureCloud as a standalone program, keeping it separate from your browser windows and tabs. Launch PureCloud automatically. Automatically start up PureCloud when your machine starts up, preventing you from missing important communications. Run in silent mode. Close the window but continue to run PureCloud in the background, allowing you to continue receiving chats and notifications. Note: Some organizations prevent users from installing and uploading applications. If your organization restricts installs or updates, contact your administrator to learn how your organization deploys the desktop app. If needed, select the language from the drop-down list in the bottom right corner of the login page. Enter your email address and password, select your organization’s region, and click Log In. Are you a member of more than one organization? If you use the same email address to log in to multiple organizations, you must enter an organization name when you log in. 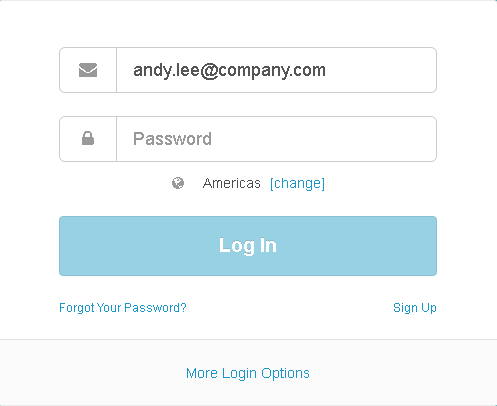 PureCloud may ask you to enter an organization name, or you can click More Login Options. Does your organization use single sign-on? If your administrator enabled single sign-on (SSO), click More Login Options to enter the organization name and authenticate with the Identity Provider, for example, OneLogin. Once authenticated, you can log in automatically to PureCloud without entering your credentials. Don’t have a PureCloud account? To sign up for a PureCloud account, click Sign Up in the lower right corner, fill out the form, and submit. PureCloud sends you the information required to create an account.